Refresh for a brand new layout! It’s time for a brand new site and gallery design! We hope you love it as much as we do! Thanks so much much to our good friend Hayley, she did a brilliant job setting up the header and coding the layout for us, using a header premade thanks to Edge Design. Also, a big thanks to NinetyFour Designs for her lovely theme base. There are so many rumours/gossips around the 20th anniversary and most of them i don’t want to believe. As Denden Forums is down for a week, i decided to share the latest one with you guys. Is it true? I have no idea. But NO replacements, please? Thanks. Mel B, Geri Horner and Emma Bunton are thought to be in talks for a three-part series to follow them on the road to their huge 20th anniversary celebration, but Victoria Beckham and Mel C are not said to be involved. A source told The Sun: “The Spice Girls comeback is the big story in pop so it’s no wonder the girls want to maximise their popularity. However, it is thought the trio won’t be joined by their bandmates Victoria and Mel C as they film footage from the recording studio and relive memories from the 90s. The news comes only hours after it was revealed Simon Cowell is “desperate” to spearhead a Spice Girls album. A source said at the time: “Simon is desperate to make a new Spice Girls album. He doesn’t want to miss out after the first time around. “He spent the X Factor auditions last week quizzing Mel about the band and said he would do ‘something mega’ if they signed with him. He kept asking if they were going to be producing new music and said if so, he wants to do it with them. He even went as far as warning Mel that they’d better not talk to any other labels before meeting with him. Mel has previously revealed The Spice Girls are determined to mark the 20th anniversary of their debut album in some way. As a woman who loves fashion, Victoria Beckham knows a thing or two about shopping for it. And this expert knowledge is evident in every aspect of her first-ever boutique, which opens today in London’s Mayfair. But forget any mental images of Mrs B proudly positioned behind a till. While she promises to be in the 6,000sq ft store ‘a lot’, there are no tills to speak of. Nor, indeed, is there a display window. Or rails of designer frocks as soon as you enter. In an exclusive tour of the Dover Street space last week, the designer described why she shunned such traditional features in favour of a contemporary space dominated by a soaring staircase. It is unrecognisable from the original space, Mrs Beckham revealed. A wall of bottle green glass defines the changing rooms, which, unlike many we have all experienced, are decently sized with generous rail space and a bench to sit. The lower level will be dedicated to personal shopping, while the upper level houses the main Victoria Beckham collection. Each piece hangs from the ceiling on a ‘blonde gold’ chain that is a larger version of those that feature on her handbags. A giant screen streams the autumn/winter 2014 catwalk show at one end, while a cluster of wooden benches in the centre invites partners, friends and kids to linger. In fact, making husbands welcome is a purposeful move on the part of Mrs Beckham. With her handbags and main collection dresses retailing for upwards of £1,500, those men will need deep pockets if they are shopping chez VB – but there is no question that the 40-year-old designer’s creations are in hot demand. Last year the label took £30million in sales – a figure that looks set to grow with the launch of pre-collections, footwear and of course the store. SPICE GIRLS AT OLYMPICS CLOSING CEREMONY! Spice Girls // Wannabe // Spice Up Your Life – live at the Olympics Closing Ceremony 2012 from melanie c online on Vimeo. Click HERE to buy it on Itunes! This mashup is included at an album called ‘A Symphony of British Music’. And good news everyone: A DVD and Blu-Ray featuring the whole Opening and the Closing Cerimony will be released by BBC on October 29. We cant wait! David Beckham has revealed that despite sometimes being tough on his children when it comes to chores, he cooks up a mean plate of pasta. The 37-year-old footballer told Newsround that both he and wife Victoria are both fairly strict parents, with pocket money being restricted if household chores are not completed. “Victoria’s the strict one to a point and after that I kind of take over. But we’re both kind of strict, we were brought up like that,” he explained. Aside from talking about housework, Beckham also admitted he is actually quite the master chef. 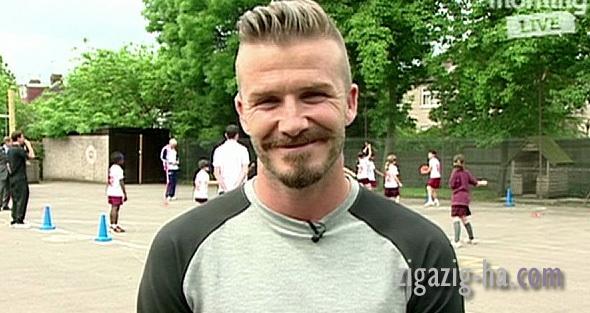 When it comes to football though, it seem that Beckham’s hard-line parenting stance softens. I have been adding new pics since yesterday. Victoria Beckham is in London for the London Fashion Week and we have all HQ pics. I dont have time at the moment to post the thumbs here coz im busy with work, but you can check the pics that are already up on the Gallery. There are more to be posted! There are also new Geri Halliwell pics aswell. When i have more time (and it will be soon) i will post the thumbs with the links here.